Sponsored by the IEEE Cybersecurity Initiative and the IEEE Computer Society Technical Committee on Security and Privacy, the IEEE Secure Development Conference (SecDev) is a venue for presenting ideas, research, and experience about how to develop secure systems. 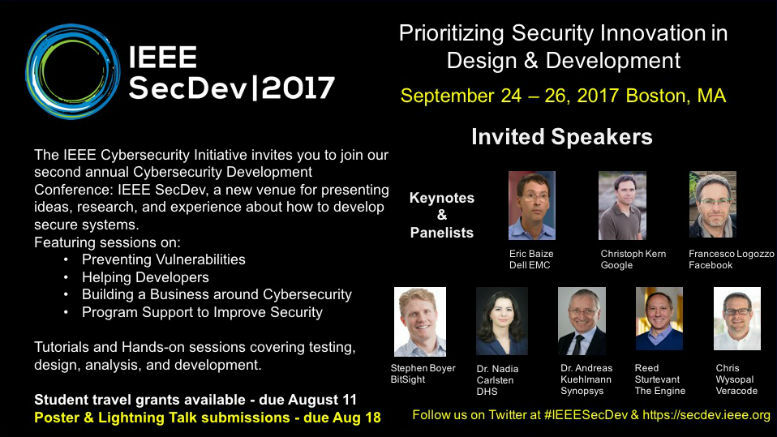 Taking place 24-26 September 2017 at the Hyatt Regency, Cambridge, MA, SecDev is distinguished by its focus on how to “build security in” (and not simply to discover the absence of security). Its goal is to encourage and disseminate ideas for secure system development among both academia and industry. Developers have valuable experiences and ideas that can inform academic research, and researchers have concepts, studies, and even code and tools that could benefit developers. Conference organizers anticipate that attendees from academic conferences like IEEE S&P, USENIX Security, PLDI, FSE, ISSTA, SOUPS, and many others could contribute ideas to SecDev, as could attendees of industrial conferences like AppSec, RSA, Black Hat, and Shmoocon. The conference will offer exciting keynotes and talks. Organizers are now looking for posters and lightning talks! The conference is also looking for nominations for the IEEE Awards for Innovation and Practice! Donors to the 2017 conference are being sought. Last year had terrific invited talks, presentations, and tutorials. Visit the conference website for more details and registration information.